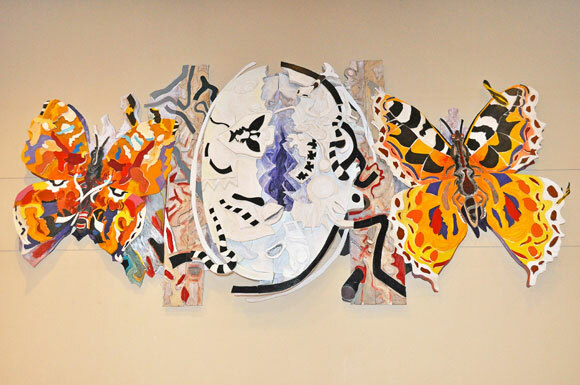 Jack Shadbolt’s Primavera now graces the south wall at UBC’s University Centre Ballroom. It may be winter, but two bright and colourful butterflies have made a recent and dramatic appearance at UBC’s Okanagan campus. Susan Belton, UBC’s Public Art Collection Curator, is celebrating the installation on the Okanagan campus of a second artwork by renowned Canadian artist Jack Shadbolt. This time, two enormous, colourful butterflies flanking a central chrysalis have been installed in the Ballroom inside University Centre. Titled Primavera, the wooden construction is 9.5 feet high, 20.5 feet wide and weighs 1,100 pounds. The sculpture now covers the south wall in a room used for many special events and public functions. Primavera comes to UBC Okanagan as a generous art loan from Kelowna’s Tantalus Vineyards. It was initially created by Shadbolt for an installation in Vancouver’s MacMillan Bloedel Building in 1987. Shadbolt made the work in the same year as Tree of Life, now installed in the Reichwald Health Sciences Centre on the UBC Okanagan campus. Two years ago, celebrated Canadian poet Patrick Lane received an honorary degree from UBC Okanagan. He gave an emotional and inspirational Convocation address about a blue butterfly he once found on a cold December day in Kelowna—very near the current site of UBC’s Okanagan campus. The butterfly theme, its renewal and exuberant life, is well symbolized at the university. Belton also acknowledged the invaluable help of Pauline Boyle of Vancouver, who worked tirelessly to help bring the project to completion. Jack Shadbolt (1909-1998) was a major Canadian artist with 70 solo exhibitions and important retrospectives at the Vancouver Art Gallery, the Museum of Anthropology at UBC, and the Glenbow Museum. Shadbolt represented Canada in many international exhibitions, including the prestigious Venice Biennale, the Sao Paulo Biennale, the Carnegie International at Pittsburgh, and the Brussels and Seattle World’s Fairs. In 1969, a 30-year retrospective of his work was shown at the National Gallery of Canada and subsequently toured the country. In 1972, Shadbolt was appointed to the Order of Canada, and in 1973 he received the University of Alberta Canadian Artist's Award. In 1990, he became a member of the Order of British Columbia. He also received honorary degrees from all three major research universities in British Columbia. The UNC Ballroom from a wide-angle view.